Based on the post, you might suppose that I categorically hate action points. Not so. Although I dislike gamey resources in a game focused on role playing, I don’t draw such a hard line that I find something as innocuous as action points terribly upsetting. Sure, you cannot manage your character’s action points while immersed in character, but you need not step out of character for long. When I play, I certainly enjoy spotting a moment when I can spend an action point to make a big impact. Enough players enjoy action points, that I can accept that they could merit a place in the game. 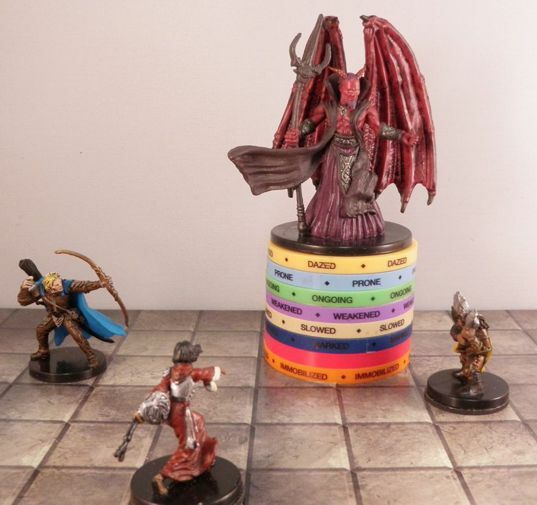 In a system like Dungeons & Dragons 3.5 or D&D Next, the fourth-edition action point mechanic, where players spend a point to gain an action, would just give players a fun boost. But ironically, this 4E mechanic works badly in 4E because of the big, potent daily and encounter powers endemic to the system. Once upon a time, only magic users and clerics possessed anything like daily powers. Because few cleric spells did much in combat, typically only magic users could unleash battlefield-clearing attacks or force the boss to save or die. Every other character class stuck with at-will attacks. The 4E designers sought to grant every class the fun making the grand attacks once limited to magic users. Players of every class suddenly enjoyed the presumed fun of managing a portfolio of encounter and daily attacks. This entry was posted in D&D fourth edition, Role-playing game design and tagged action points. Bookmark the permalink.